To renew Radio NRJ’s studio from a visualization technology point of view, Radio NRJ came to VuWall Technology because of the company’s expertise in Multi-surface display functionality across rooms. VuWall Technology is pleased to announce VuWall TRx, its newest software platform, which is especially designed to allow AV integrators and operators to easily deploy, configure and maintain IP encoding and decoding devices. VuWall2 now supporting new IP decoding hardware from Datapath and Matrox Graphics Inc.
VuWall will be presenting its latest version of VuWall2 software that will include a lot of exciting features for enhanced collaboration, surfaces management and IP decoding capabilities. VuWall has integrated the functionalities of its VuWall2 video wall management software into the Coconote touch table of Virtual Sensitive. 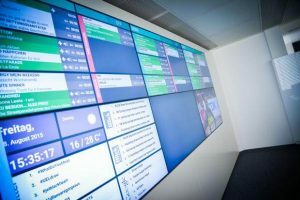 VuWall2 has been selected as a finalist for the most innovative management and control solution for video walls. Mitsubishi Electric will be presenting their visual information systems running VuWall2 during Milipol Paris 2015, from November 17-20, inside booth 5L199. Expotech is an annual event, beginning October 5th, 2015, to showcase the success stories of Palestinian businesses and address the importance of building awareness around entrepreneurship and growth through innovation. VuWall2 will be demonstrated at the InfoComm show in the VuWall Technology booth (# 4991), as well as at the Exxact Technology booth (# 2987) and the Datapath booth (# 4571). Oculus Operational Innovations has officially partnered with VuWall Technology as its exclusive African distributor for the VuWall technology hard- and software solutions for video walls. VuWall Technology, in partnership with Ionodes Inc., will be on display at ISC West in Las Vegas, from April 15th – 17th. Would you like to find out more about VuWall? Only 1 email per month - we promise!